Recently, I've been obsessed with Russian matryoshka dolls. I'm not sure if I'm ready to commit to a tattoo of one (although I really like the "classic tattoo" feel of some of them, especially this one, with the roses and polka dots and all), so I think I will probably try to do a painting of one this week. I've been thinking about these little figurines a lot lately. First, because they're adorable and I love the handcrafted uniqueness of them. But it's also because of the visual metaphor that's been explored countless times before: inside each of the dolls is an identical but smaller version of itself. (The comparison is also made with onions - the matryoshka are so much more beautiful!) Every time you open up a doll, the doll you find inside is exactly the same, only smaller. ... a funny thing happened on the way to becoming a size 8: No matter how much (Jen) Larsen shrank, her troubles stayed the same size. "It (weight loss) hasn't solved all my problems or made me a better person, just a littler one," Larsen says. Despite being a self-described "accomplished fat girl," with a master's degree in creative writing from the University of San Francisco, a great job working in the school's academic library, a slew of friends and a loving boyfriend, Larsen thought her life had hit a plateau. By age 32, she believed she'd be writing a book, "doing something important," she says. The only thing holding her back, she thought, was weight. "Not so," she now says. "The only thing that's different is the size of my a**." A dietician interviewed for the article refers to this as "the lottery effect." People who play the lottery tend to see winning as a cure-all: if only they hit the big jackpot, all their problems would go away. Winning may take care of some of the issues, but not everything. And weight loss is exactly the same way. As I slowly but surely lose my way down to my long-term goal weight, I need to keep this in mind. Losing the weight is only half of my battle. No matter how small the matryoshka is, she's still essentially the same girl she was when she was at her biggest. There are so many other problems I need to work on that won't be magically cured when I lose fifty, a hundred, two hundred pounds. For example, my shyness. The social anxieties I've developed as a result of my obesity have been in place for so long. I honestly can't say how I'll feel two hundred pounds from now (or even just two pounds from now), but I know that in the past, weight loss has brought good intentions to go out, but my efforts to try to be a sociable person were always hindered by my fears that I had not yet lost enough weight to be taken seriously. So I would go out with guys who treated me poorly, who would manipulate my weaknesses to their benefit, and who knew they could get away with it because I was so fat that I must be simply grateful for their time. And it was true. I let myself be mistreated because I thought it was better than being alone. And of course, I always ended up hurt - consoling myself meant bingeing - and the cycle would begin again. I've often wondered if I'll ever lose enough weight to feel totally comfortable being myself, or to finally date good, honest, well-meaning guys. So now, as I finally commit to lose weight for good and to take control of my life, I'm so grateful that weight loss takes a long time - as nice as it seems it would be to "hit the jackpot" and be magically cured, I truly need this time to learn how to love myself and how to be a person who is open to love and able to trust. 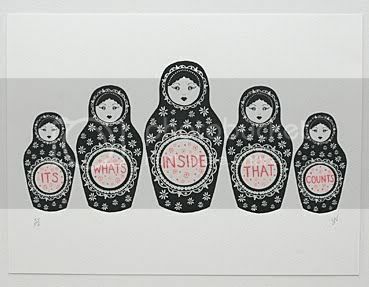 I have enjoyed the Russian nesting dolls for years, but never looked at them in this context... what an eye-opener. Thank you for that. You mentioned you wondered how losing the weight might affect your shyness.... I am only halfway to goal, but even shortly after I started, I noticed one change. I used to hate going out of the house. I would usually end up a target of someone's cruelty. But after I started this journey, *I* felt proud of my efforts. *I* knew what I was doing, even if those cretins who felt they had a right to throw insults my way didn't. So the affect was, I now had a new self-respect. Fragile, yes. But it was there and growing. And I am even learning to stick up for myself, and refuse to accept being treated "less than". So you just might surprise yourself, and find you aren't quite as shy as you thought, once you get your Self-Respect flag flying, LOL! I'm am definitely putting this post in my Favorites file!! A BIG SMILE FOR THIS ONE!